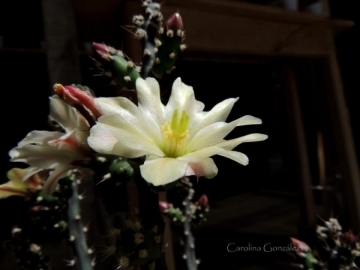 Origin and Habitat: Austrocylindropuntia salmiana is native to Paraguay (Boquerón and Alto Paraguay departments), Bolivia, and northern Argentina (Catamarca, Córdoba, Entre Ríos, Jujuy, Salta, Santiago del Estero, Santa Fe, and San Luis provinces). It has been cited for southern Brazil, but this is likely a mistake. 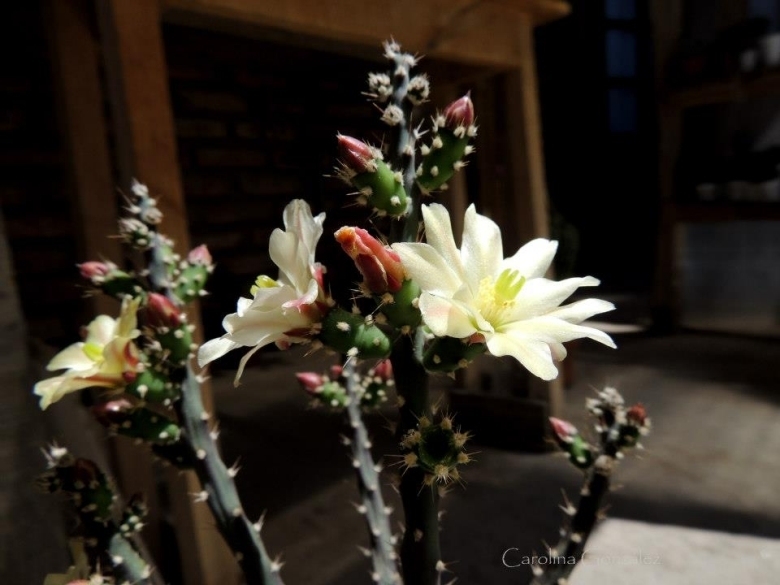 Elevation range: This cactus occurs at elevations between 100 and 1,500 metres above sea level. Habitat and Ecology: This species may occur in alkaline soils and rocky areas in the Sierras Pampeanas. It occurs in the border of the xerophilous Chacoan forest, particularly in the transition between Humid Chaco and Dry Chaco regions. This species is not used or commercialized. It is invasive in many areas. It is favored by livestock grazing, as it is dispersed by adhering itself to the fur of animals. It can be locally abundant in many areas, and there are no known threats affecting it. 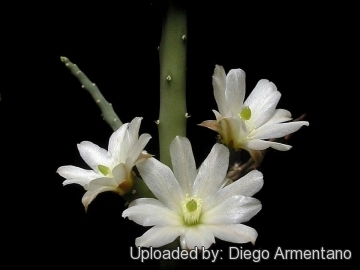 Description: Austrocylindropuntia salmiana, formerly known as Opuntia salmiana, is a shrubby Opuntia 3 dm. to 2 meters high, much branched at base. The large yellow flowers contrast beautifully with the red-purple of the young stems. 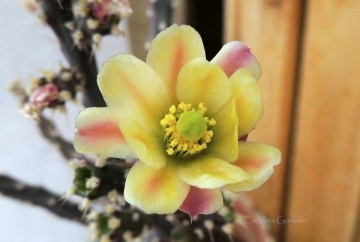 It flowers freely even when grown indoor. Strikingly enough, in Austrocylindropuntia salmiana the fruits are highly proliferous; each lateral fruit may break off the receptacle and form a new plant; fruits of this species do not contain seeds and reproduction is completely vegetative. Stems: Branches (segments) often weak, cylindrical, terete, up to 25 cm long and 1.5 cm in diameter or less, deep blue-green often purplish, not tuberculate. Spines: Sometimes wanting, usually several, to 1.5 cm long or less, white. fruits: Sterile, clavate, scarlet, spineless or nearly so. The fruits have the capacity to develop roots and shoots, behaving like seedlings in this way. 3) Oakley, L. & Pin, A. 2013. Opuntia salmiana. The IUCN Red List of Threatened Species. Version 2014.3. <www.iucnredlist.org>. Downloaded on 10 April 2015. 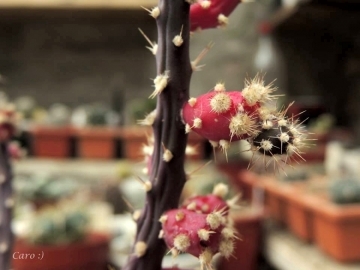 Cultivation and Propagation: Austrocylindropuntia salmiana is a semi-hardy cactus easily found in cultivation. Make sure your Austrocylindropuntia is not exposed to temperatures below -4°C or it may die. Nevertheless it is a good advice never let the night-time temperature fall below 5°C. It is a summer grower species that offers no cultivation difficulties. 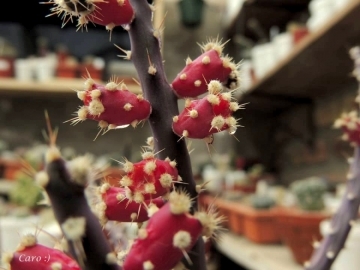 Growing this cactus in a container or pot restricts its growth. This species is not self-fertile and must be propagated from cuttings. Note that this South American plants have a tendency to spread and sterile fruits that break off can start new plants in adjacent pots. These are fun plants for kids to have and experiment with and provide a good lesson in plant propagation. 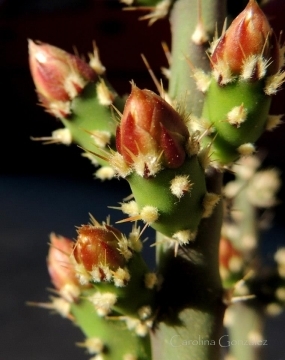 Hardiness: It is dslightly frost resistant cactus, hardy to -4° C if very dry. However in cultivation it is better not to expose it to temperatures lower than -5° C, even if in an aerated and protected location, in order to avoid the formation of anti-aesthetic spots on the epidermis. In presence of high atmospheric humidity avoid any frost as it is sensitive to root rot. USDA Zone 9-10. It can handle extremely high temperatures in summer. Warning Handle with care! The little glochids at the base of the spines are quite a nuisance and the minimal touch may be fatal. It is best to use gloves to handle this plant.